Happy Easter and Happy April Fools Day! Since I first started observing Easter on this blog in 2015, I've been alternating between my two default holiday themes, drinks from Tipsy Bartender on odd-numbered years and drum corps on even-numbered years. Since this is an even-numbered year, it's drum corps. Since it's also April Fools Day, it has to be something that isn't entirely serious. That's hard to pull off on what serious believers consider to be one of the two most important holidays on the Christian liturgical calendar, if not the most important. Fortunately, I have just the piece of music for the occasion, Leonard Bernstein's Mass. The son of Russian-Jewish parents, a social liberal, and lifelong activist, Bernstein made a surprising choice: the Roman Catholic Mass. But instead of a straightforward, purely musical setting of the Latin liturgy, he created a broadly eclectic theatrical event by placing the 400-year-old religious rite into a tense, dramatic dialog with music and lyrics of the 20th century vernacular, using this dialectic to explore the crisis in faith and cultural breakdown of the post-Kennedy era. Bernstein and Schwartz envisioned MASS not as a concert piece, but as a fully staged, dramatic pageant. They mixed sacred and secular texts, using the traditional Latin liturgical sequence as the fundamental structure and inserting tropes in contemporary English that question and challenge the prescribed service, as well as meditations that demand time for reflection. They took the Tridentine Mass, a highly-ritualized Catholic rite meant to be recited verbatim, and applied to it a very Jewish practice of debating and arguing with God. The result was a piece that powerfully communicated the confusion and cultural malaise of the early 1970s, questioning authority and advocating for peace. I also have the perfect corps for this purpose, The Cadets, who have played the piece three times. * Drum Corps International has the most recent, 2017 The Cadets - "The Faithful, The Fallen, The Forgiven. That's just a clip of the middle of the show. Vic Firth Marching has a complete performance in 2017 CADETS FINALS WEEK REHEARSAL RUN (Press Box Cam). As the Cadets prepare for the 2017 DCI Championships in Indianapolis, VIC FIRTH gives you an exclusive up-close look at their rehearsal run-through during finals week! That's the most recent use of the composition in The Cadets' repertoire. Follow over the jump for the two earlier ones. 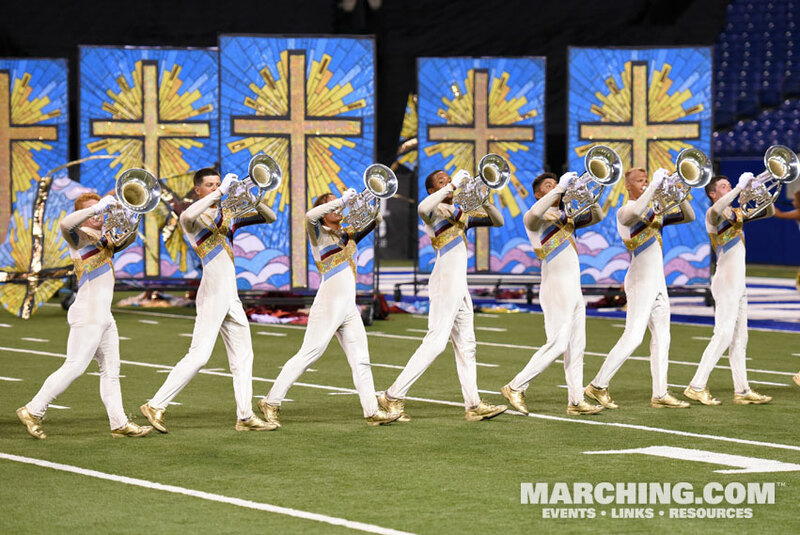 The first, which helped the oldest active DCI World Class corps win its first DCI championship, occured in 1983, a Cadets History episode from Youth Education on YouTube. The third time happened in 1990, which DCI Final Minutes uploaded as 1990 Cadets of Bergen County - "Undiscovered Bernstein" - Final 1:00. The piece helped the corps win another championship. Too bad the third time was not also a charm. The final minute of the Cadets of Bergen County 1990 1st place show, featuring the music of Leonard Bernstein.This performance took place at Rich Stadium in Orchard Park, New York on August 18, 1990. I have only one more thing to say about The Cadets using Mass -- "For Holy Name shall always be." Amen. *It's somewhat unusual for me to use all of a resource at once, but the next time Easter falls on April 1 will be 2029. That's far enough off that I'm not worried about running out of material. Besides, it's an odd-numbered year -- Easter drinks!